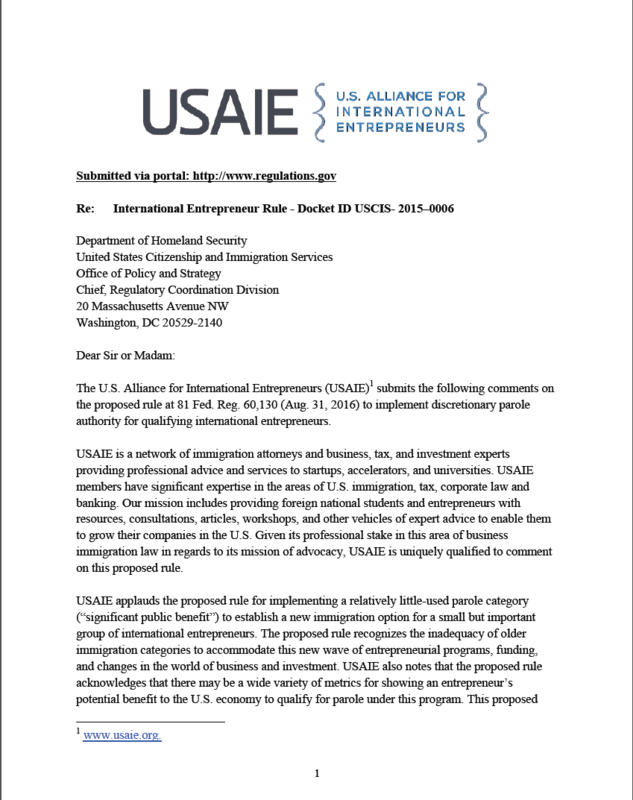 On October 17, 2016, USAIE officially submitted comments on the new international entrepreneur rule proposed by USCIS. These comments were submitted via the portal at regulations.gov. Click here for a PDF version of the complete comments. A transcript is included below. Do not hesitate to contact us if you have any questions regarding the proposed entrepreneur rule or our response. The U.S. Alliance for International Entrepreneurs (USAIE) submits the following comments on the proposed rule at 81 Fed. Reg. 60, 130 (Aug. 31, 2016) to implement discretionary parole authority for qualifying international entrepreneurs. USAIE is a network of immigration attorneys and business, tax, and investment experts providing professional advice and services to startups, accelerators, and universities. USAIE members have significant expertise in the areas of U.S. immigration, tax, corporate law and banking. Our mission includes providing foreign national students and entrepreneurs with resources, consultations, articles, workshops, and other vehicles of expert advice to enable them to grow their companies in the U.S. Given its professional stake in this area of business immigration law in regards to its mission of advocacy, USAIE is uniquely qualified to comment on this proposed rule. USAIE applauds the proposed rule for implementing a relatively little-used parole category (“significant public benefit”) to establish a new immigration option for a small but important group of international entrepreneurs. The proposed rule recognizes the inadequacy of older immigration categories to accommodate this new wave of entrepreneurial programs, funding, and changes in the world of business and investment. USAIE also notes that the proposed rule acknowledges that there may be a wide variety of metrics for showing an entrepreneur’s potential benefit to the U.S. economy to qualify for parole under this program. This proposed rule reflects the growing effort by government and stakeholders to close the gap between current immigration rules and the established importance of new businesses as drivers of economic growth, technological innovation, and job creation. We are confident that USCIS initiated this rulemaking process with the best of intentions to meet the goals described above. With that in mind, USAIE submits the following comments to provide additional information on how to judge the potential of a foreign national to contribute to the U.S. economy through job creation and economic growth. These comments were culled from business leaders, universities, legal experts, and international entrepreneurs throughout the country. As a result, this letter reflects the views, comments, and suggestions of multiple stakeholders who will be directly impacted by the proposed rule. USAIE recommends that the final rule modify the proposed definition of entrepreneur that, in relevant part, would require an entrepreneur to be “well-positioned, due to his or her knowledge, skills, or experience…to substantially assist” in growing the business in the United States. The proposed rule is unclear as to how an applicant would demonstrate this requirement. We suggest that the “substantial ownership interest” test in the same provision provides a rebuttable presumption that the entrepreneur is “well-positioned” and that the “significant capital financing” requirements reflect the market demand for the entrepreneur to grow the business. USAIE recommends that the final rule allow independent contractors to be counted as “employees” for purposes of the entrepreneur’s qualifying for parole, particularly if the majority of the contractor’s time is spent working for the startup entity. The proposed rule states that a qualified full-time job would mean “paid employment in a position that requires a minimum of 35 working hours per week” and disqualifies the work of independent contractors from the purview of a “qualified job.” However, DHS has considered and endorsed less restrictive scenarios in the adjudication of L-1 and H-1B petitions. Guidance on L-1 processing shows a clear intent to establish multiple indices for determining employment beyond that of mere compensation. For example, DHS considers the intended relationship between the employer and the employee, the rendering of service, and the power of control over the employee’s activity. The State Department’s Foreign Affairs Manual states that “the beneficiary’s salary and benefits are not controlling” in determining employment in the L-1 context and that a beneficiary “is not precluded from establishing eligibility for L classification” even if the petitioner does not pay her/him directly. For H-1B purposes, DHS again states that “engaging a person in work is more than merely paying the wage or placing that person on the payroll.” These prongs go directly to the intent of the proposed rule’s “job creation” requirement for parole. There is also a clear contrast between the L-1 and H-1B contexts and that of labor certification, where Matter of Modular Container Systems established the need for a bona fide employer-employee relationship, while also acknowledging different standards for investors. Although the proposed rule claims that requiring 10 full-time employees would ensure the “significant public benefit” of the startup, we believe that the definition of “full time” used therein is too restrictive because it does not include combinations of part-time employment. The proposed rule justifies this narrow definition by citing DOL standards but fails to point out that the DOL in fact allows for combinations of part-time positions, so-called “full-time equivalence,” in determining the number of a company’s full-time employees. The same should be allowed for entrepreneurial startups, given the heavy demands they face. As an alternative to the 10 employee rule, USAIE recommends that the final rule should allow five full-time employees or equivalents if each of the five employees are paid at least $47,500 a year. That salary amount is the level set by the Department of Labor for exempt employees in a new rule that takes effect December 1. This would be strong proof of job creation and a contribution to the U.S. economy. The proposed rule states that parole decisions would be based on the totality of the evidence, including evidence from “other means,” which presumably includes Internet searches and information from other government agencies. USAIE recommends that these situations require a formal Request for Evidence (RFE) if USCIS plans to deny parole on the basis of information it found from other sources. This change would be consistent with AFM Ch. 10.5 on “Requesting Additional Information.” We also recommend that the final rule allow for Motions to Reopen/Reconsider. Similarly, given the possibility that each parole application could require the submission of copious evidence to determine eligibility and thus burden both adjudicators and applicants, USAIE recommends that USCIS create a process to allow organized accelerators or incubators to register so as to bypass excessive paperwork requirements. Accelerators are significant drivers of economic growth, and USCIS acknowledges that graduating from such a program one can be a “strong indicator of the entity’s potential.” This change would mirror the intent of the L-1 blanket petition, whereby established companies receive predetermined eligibility to both speed up the transfer process and reduce the burden on all parties. In cases where the threshold investment is not met, USAIE suggests that a formal recommendation from a governmental economic development council or similar agency should be given a rebuttable presumption as “reliable and compelling evidence” of the “potential for rapid growth and job creation” to support the alternative criteria. These agencies have significant expertise in evaluating a startup company’s potential for growth. Similar to the recommendations above, this change would also reduce the burden on applicants and adjudicators concerning the submission of extensive evidence to meet this requirement. The proposed rule’s requirement to file a new application any time a material change occurs is too onerous. Startups are constantly evolving entities. Many startups have ownership changes or funding changes as new waves of financing come through. The founding entrepreneur may change job titles. If a larger company buys a startup, the parole applicant may lose some or all ownership but will remain essential for the success of the entity. Under the proposed rule, all such changes would require a new parole application. Moreover, these changes can and often occur swiftly and in immediate succession, thus creating additional paperwork requirements and confusion when a new parole application is pending. We suggest that the proposed rule reflect more closely the EB-5 immigrant investor adjudication policy, where DHS gives deference to prior approvals as long as the changes meet certain conditions. In the EB-5 context, DHS acknowledges that “the process of establishing a new business and creating jobs depends on a wide array of variables over which an investor or the creator of a new business may not have any control.” We also recommend that DHS clarify what constitutes a “material change” given the rapidly evolving nature of startups. USAIE recommends that the final rule allow premium processing requests, with a 30-day turnaround, to meet the demands of the competitive and changing contexts of startups, especially those securing funding and advancing technological innovation. We recommend 30 days, rather than 15, because of the complexity of these cases. The final rule should clarify that a parolee may apply to change status without departing the United States to seek admission. The “Cronin Memo” of May 25, 2000 http://www.eta-i.org/tramadol.html specifically allows parolees to file nonimmigrant petitions while present in the United States. The final rule should reflect the spirit of this guidance in providing flexibility for parolees with valid employment opportunities in the United States. The ability to change status is implied by the comment in the proposed rule that if parole is revoked, the parolee reverts to the status he/she had before parole was granted. We also recommend that DHS expand the final rule to clarify that on-campus employment for F-1 students includes work at an affiliated incubator, entrepreneur program, or accelerator. The proposed rule already acknowledges the importance of these entities as vehicles of economic and job growth. Given the fact that DHS further recognizes the narrow window for qualification afforded by the proposed rule, we believe it would be excessively restrictive and contrary to the intent of the rule if such a qualifying affiliation were not clarified. For this purpose, “affiliated” should mean on campus or connected to the school by either a written agreement or by being a significant contributor (50% or more) to the annual budget. The same should apply to the H-1B cap-exemption qualification. The final rule should clarify that an exemption to the H-1B cap results from work at an affiliated incubator, entrepreneur program or accelerator, given the definition of “affiliated” as noted above. Otherwise the final rule risks excluding startups run by international entrepreneurs who may not otherwise qualify for parole. For example, consider the Yale startup RxAll, an innovative pharmaceutical organization run by a team of MBAs, including international students, whose mission is to eliminate the global problem of counterfeit medications by securing a safe drug pipeline. This team was admitted into the Yale Entrepreneurial Institute’s Global Social Venture Creation Program (VCP). Because the company is not physically on campus, however, there is currently no pathway for H-1B cap-exemption. The final rule should extend employment authorization “incident to status” to the spouses of parolees, rather than requiring that they apply for employment authorization. This change would eliminate a lengthy application process for a spouse who faces the challenge of alleviating the economic burdens a family may face given the nature of entrepreneurial work. The proposed rule already acknowledges this consideration. We also recommend here that E visa holders receive work authorization incident to status, and their spouses too, for the same reasoning: to support entrepreneurial activity in the United States. The Social Security Administration recognizes E visa spouses as employment-authorized incident to status, but government systems such as E-Verify do not. The final rule should clarify that any foreign investor can contribute directly to the startup, including family members. And the U.S.-based family members can be qualifying investors. This recognizes data showing that family members are a key source of funding for entrepreneurial activities. Regarding the investment criteria, we have consulted with entrepreneurial programs at major universities, and have the following targeted suggestions. We appreciate the time and effort that USCIS and the Small Business Administration have put into trying to establish metrics for an entrepreneurial venture. As an alternative to investment thresholds, there could be a revenue (profit) threshold. This is a solid metric of the potential of a company to succeed. We recommend that if a company has $50,000 in profit for the previous year, there does not need to be U.S. investment. Overall, USAIE recommends, as an alternative to investment/annual growth thresholds for the two-year extension, that the final regulation accept two of the following four options — job creation, profit, investment, or annual growth. This recognizes the quite varied nature of entrepreneurial businesses. USAIE recommends lowering the percent ownership required to extend parole after two years. Capital-intensive industries often have lower percent ownership. A two percent ownership requirement after two years is reasonable, especially for a startup company that may require significant investments to set up laboratories in the research and development phase. Also, as an alternative to percentage ownership after two years, USAIE recommends allowing allow equity interest. For example, if after two years, the equity sale values presented to the IRS show that the foreign national has a $1 million value ownership, that should suffice even if the actual ownership interest is a relatively low percentage. USAIE recommends broadening the proposed regulation’s requirement that the parolee play a central role in operations. The DHS November 2014 memo introducing parole refers to researchers, not just managers or founders. In the technology world, “technical founders” are key employees who lead the research and development phase. USAIE recommends that these technical founders be included even if they are not managing overall operations. To keep this targeted, we recommend requiring a technical founder to have an advanced degree in a STEM field from a U.S. institution of higher education. Again, we applaud the efforts of USCIS in providing an important pathway for international entrepreneurs to contribute to the U.S. economy. We urge USCIS to take the above comments into consideration when drafting the final rule. We would be pleased to provide additional information and feedback at any time. 81 Fed. Reg. 60,164 (proposed 8 C.F.R. § 212.19(a)(1)). Id. at 60,130, 60,131, 60,136, 60,151 (supplementary information). Id. at 60,165 (proposed 8 C.F.R. § 212.19(a)(8)). Id. (proposed 8 C.F.R. § 212.19(a)(6)). “INS Discusses the Definition of ‘Employed’ for L-1 Purposes,” Interpreter Releases, Vol. 73, No. 2 (Jan. 10, 1996). “Determining Employer-Employee Relationship for Adjudication of H-1B Petitions, Including Third-Party Site Placements,” Donald Neufeld, DHS Memorandum (Jan. 8, 2010), p. 3. See throughout, 81 Fed. Reg. 60130-60168. Matter of Modular Containers, No. 89-INA-228 (BALCA July 16, 1991), at 6 n.7, available at http://www.oalj.dol.gov/PUBLIC/INA/DECISIONS/BALCA_DECISIONS/INA/1989_00228.INA.PDF. 81 Fed. Reg. 60,149 (supplementary information). See, for example, how the DOL counts the number of full-time employees to determine H-1B dependency. “Fact Sheet #62C: Who is an H-1B-dependent employer?”, DOL WHD (rev. July 2008). See U.S. Dep’t of Labor, Final Rule: Overtime (May 18, 2016), https://www.dol.gov/WHD/overtime/final2016/. As discussed throughout this comment, the proposed rule provides little measure of what might be considered “reliable and compelling” evidence to qualify an individual for parole. 81 Fed. Reg. 60,142 (supplementary information). USCIS Policy Memorandum, EB-5 Adjudications Policy, PM-602-0083, at 23-26 (May 30, 2013), at https://www.uscis.gov/sites/default/files/USCIS/Laws/Memoranda/2013/May/EB-5%20Adjudications%20PM%20(Approved%20as%20final%205-30-13).pdf. Memorandum from Michael D. Cronin, Acting INS Associate Commissioner, Revision of March 14, 2000 Dual Intent Memorandum, at 2 (May 16, 2000), available at http://www.visatopia.com/wp-content/uploads/2013/01/INS-Memo-Re-Hs-and-Ls-Who-Work-After-Entering-on-Advance-Parole.pdf. 81 Fed. Reg. 60,134 (supplementary information). See also the discussion of applying for parole from within the United States. Compare Military Parole in Place discussion of applying for parole from within the United States at the end of page 2 at “Parole of Spouses, Children and Parents of Active Duty Members of the U.S. Armed Forces, the Selected Reserve of the Ready Reserve, and Former Members of the U.S. Armed Forces or Selected Reserve of the Ready Reserve and the Effect of Parole on Inadmissibility under Immigration and Nation Act § 212(a)(6)(A)(i),” PM-602-0091 (Nov. 15, 2013), p. 2. See “Employment-Based Second Preference Immigrant Visa Category Frequently Asked Questions Regarding Entrepreneurs and the Employment-Based Second Preference Immigrant Visa Category,” www.uscis.gov/news/employment-based-second-preference-immigrant-visa-category-frequent- ly-asked-questions-regarding-entrepreneurs-and-employment-based-second-pref-erence-immigrant-visa-category. Memorandum from Jeh Johnson, DHS Secretary, Policies Supporting U.S. High-Skilled Business and Workers, at 4 (Nov. 20, 2014), at https://www.dhs.gov/sites/default/files/publications/14_1120_memo_business_actions.pdf. See Social Security Administration, Program Operations Manual System, RM 10211.420, Employment Authorization for Non-immigrants (Sept. 24, 2014), at https://secure.ssa.gov/poms.nsf/lnx/0110211420. See Kauffman Foundation, Entrepreneurship Policy Digest (June 2, 2105), http://www.kauffman.org/what-we-do/resources/entrepreneurship-policy-digest/how-entrepreneurs-access-capital-and-get-funded (showing that 20.9% of investment for “high growth entrepreneurs” are family members). This data echoes a May, 2012 report for the U.S. Small Business Administration entitled “Immigrant Entrepreneurs and Small Business Owners, and Their Access To Financial Capital,” by Dr. Robert Fairlee (contract no. SBAHQ-10-R-0009) (https://www.sba.gov/sites/default/files/rs396tot.pdf). The SBA report finds that roughly two-thirds of immigrant entrepreneurs rely on startup capital from family members. Id. at 21. Memorandum from Jeh Johnson, DHS Secretary, Policies Supporting U.S. High-Skilled Business and Workers 4 (Nov. 20, 2014), at https://www.dhs.gov/sites/default/files/publications/14_1120_memo_business_actions.pdf. This entry was posted in News and tagged Discussion, Immigration Law, Proposed Rule, USCIS. Bookmark the permalink.